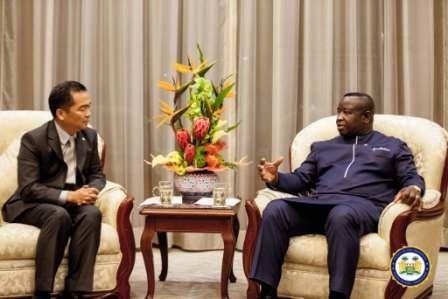 Beijing, China, Friday 31 August 2018 – His Excellency President Julius Maada Bio has engaged the PowerChina International Group Ltd. on the construction of Lungi Bridge despite the fact that he has never promised it in his manifesto and campaigns. During the elections as then Presidential Candidate, His Excellency President Bio was fondly remembered as the candidate who repeatedly stated that he would be a President who would ‘under-promise’ and ‘over-deliver’ rather than a President who ‘over-promised’ and ‘under-delivered’. Following a successful meeting, President Bio invited PowerChina to visit Sierra Leone for a more detailed discussion with the relevant line ministers and Chairman of Presidential Infrastructure, Dr. John Tambi. President of PowerChina International Group Ltd accepted the invitation and agreed that the company would visit Sierra Leone in October during which discussions would be held on a feasibility study, detailed financing and a technical meeting on the design with Dr. Tambi. President Maada Bio Where Are You?